Today dawned more on the gloomy side. We had planned to go sailing for the day in the Bay of Islands, but with rain in the forecast (which arrived a little earlier than predicted), we decided to cancel the trip since rainy photos on sailing boats don't really cut it! We reorganised our plans while sitting in the camper, and since the rain was setting in for at least the next three days we decided to return to Auckland and spend the time catching up on some work. We basically drove all the way through, only stopping for ice cream in Orewa just north of Auckland. While enjoying the best ice cream in New Zealand (Tip Top - orange choc chip and Banana choc chip) we stood and watched the frantic activity on the beach. 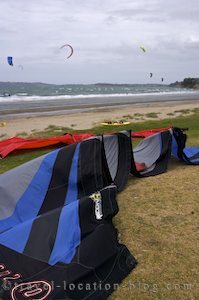 Today was obviously a good day for kitesurfing in Orewa, in fact I think there were more kitesurfers than swimmers this particular day. Kitesurfing is also referred to as kiteboarding or even fly surfing. There are many tricks and fancy moves that can be performed and boy can these surfers get up and go!! It is important to learn the sport from the pros before attempting it solo since it can be dangerous. Moving on from Orewa, we hit the big smoke (Auckland) once again. We'll be holed up here for a couple of days catching up with work while the wet weather runs its course.